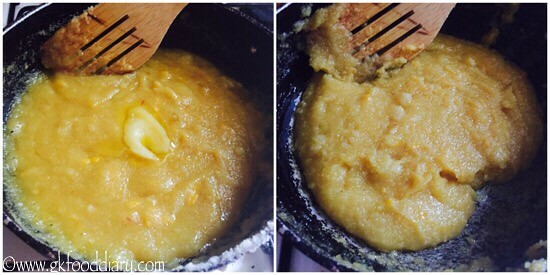 Its ideal for babies after one year, if you want to try this mango sheera for babies less than a year, skip sweetener and make it with less ghee than mentioned. 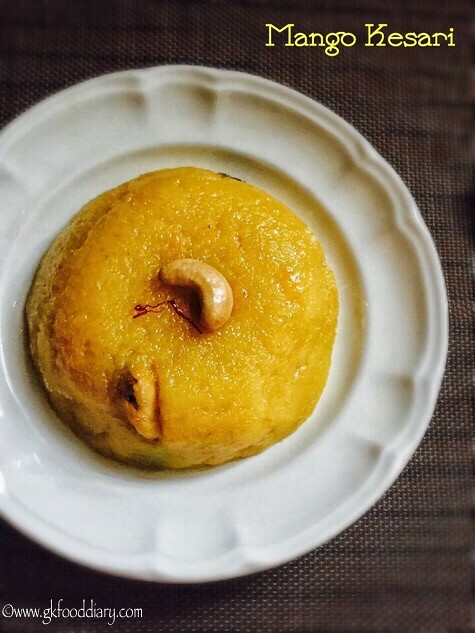 Now Let’s check how to make this sooji mango halwa recipe for toddlers and kids. Keep all the ingredients ready. Wash and peel the mango and collect the pulp. Remove the center seed. 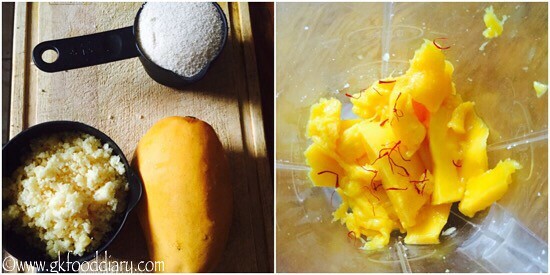 Puree the mango pulp along with saffron strands using a blender. 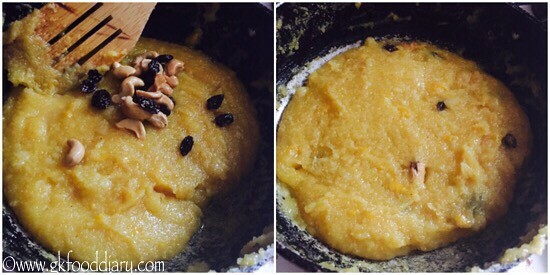 In a thick bottomed pan, add a tbsp of ghee and fry the cashews & raisins. Remove from the pan once done and Keep aside. Then in the same pan, Roast sooji until nice aroma comes. Make sure the sooji/rava doesn't change its color. Remove from the pan and transfer it to a plate. Then add required amount of water to it and bring the water to boil. When the water starts boiling add pureed mangoes and mix well. Then add roasted sooji/rava. Keep stirring the sooji/rava until porridge like consistency is reached, then cook covered in low medium flame for 3-5 minutes or until the rava/sooji is completely cooked. 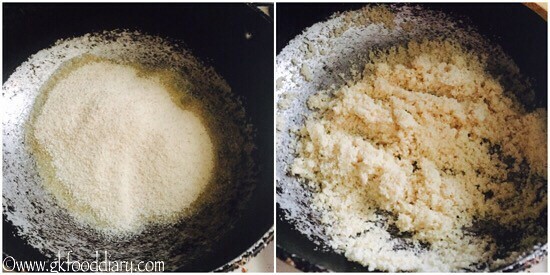 Once the rava/sooji is cooked add powdered jaggery and cardamom powder. Now the halwa starts liquidized. 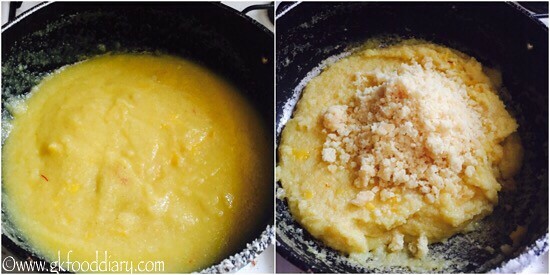 Keep stirring in between and add the remaining ghee little by little. 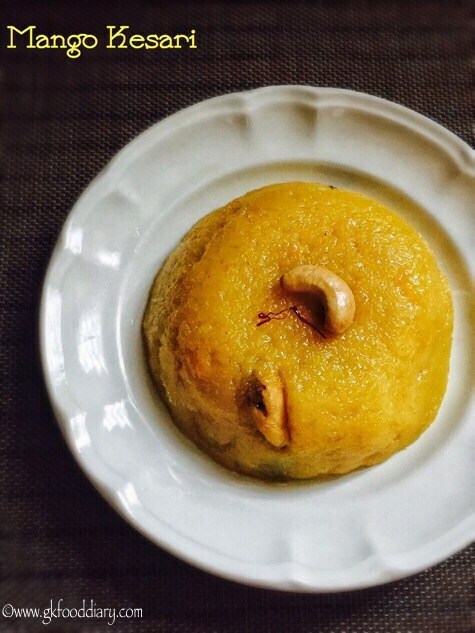 When the kesari/halwa forms a whole mass and doesn't stick to the pan, add ghee fried cashews & raisins. Switch off the flame once done. 1. Keep all the ingredients ready. Wash and peel the mango and collect the pulp. Remove the center seed. 2. 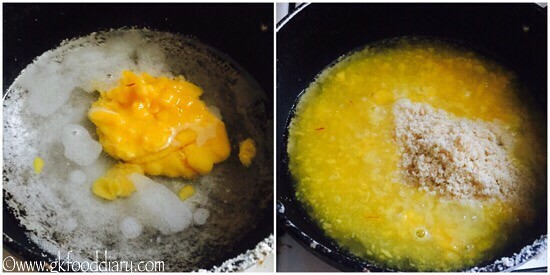 Puree the mango pulp along with saffron strands using a blender. 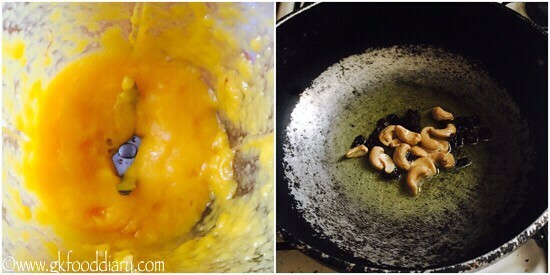 In a thick bottomed pan, add a tbsp of ghee and fry the cashews & raisins. Remove from the pan once done and Keep aside. 3. Then in the same pan, Roast sooji until nice aroma comes. Make sure the sooji/rava doesn’t change its color. Remove from the pan and transfer it to a plate. 4. Then add required amount of water to it and bring the water to boil. When the water starts boiling add pureed mangoes and mix well. Then add roasted sooji/rava. 5. Keep stirring the sooji/rava until porridge like consistency is reached, then cook covered in low medium flame for 3-5 minutes or until the rava/sooji is completely cooked. Once the rava/sooji is cooked add powdered jaggery and cardamom powder. 6. Now the halwa starts liquidized. Keep stirring in between and add the remaining ghee little by little. 7. When the kesari/halwa forms a whole mass and doesn’t stick to the pan, add ghee fried cashews & raisins. Switch off the flame once done. 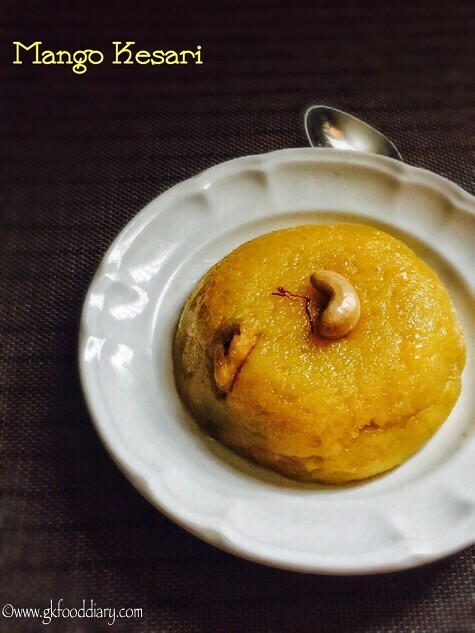 Tasty sooji mango halwa is ready ! 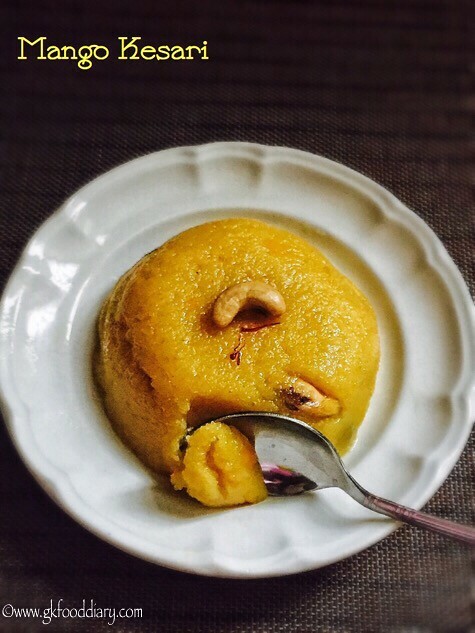 Adding saffron gives a nice yellow colour to the halwa. Adjust jaggery amount as per the sweetness of mango. You could use broken wheat rava instead of sooji. When selecting mangoes, choose sweet tasting variety.